Hi there, Happy Friday! Seems hard to believe the week has just flown by.. but I think I say that every week. 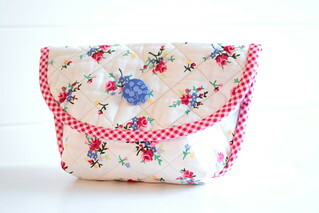 I've had my Annie Pouch from K Cotton Studio finished a couple of days ago but didn't get around to getting a picture. 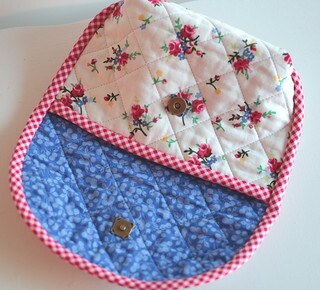 I love how this little purse is totally finished inside and out.. it's really nicely designed. The pattern has instruction for adding an optional handle which would be super cute. I just want to make a million of them, they're so sweet. I really like the decorative sew in magnet as well. I'm a little fussy, so I'm wishing I'd paid just a tad more attention when cutting out the rectangle so my diagonal quilting would have been centered. I definitely would do that next time. Also I think I'd make a big covered button, but then take the shank off so it could lay flush with the flap, and I could fabric glue it down. My little floral cabochons didn't look cute with this fabric, so I'll use them on something else. that is adorable. I love the fabric. Happy Friday! Enjoy those exciting times.